The compact and oval shaped front and squared back, makes the E-Z Split Cup easy to use for both women and men. NOTE: In order to prevent any incorrect results, the test results should not be interpreted after 15 minutes. Positive: A colored line is visible in each Control Zone. No color line appears in the Test Zone, indicating a preliminary positive result for the corresponding drug of that specific Test Zone. We recommend sending this positive urine specimen to a certified laboratory for confirmation. The length of time following drug use for which a positive result may occur is dependent upon several factors including the frequency and amount of the drug taken, metabolic rate, drug half-life, and the drug use�s age, weight, activity, and diet. There are many different ways to beat drug test. To maintain the quality of the urine specimen and detect for the presence of any of these methods for misrepresenting the urine sample, we offer our adulteration or specimen validity test. 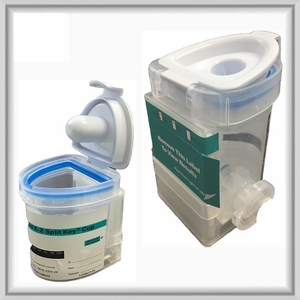 Interactive step by step instruction, how to use Integrated E-Z Split Key Drug Screening Cup is HERE!